Yesterday as I was taking my walk, I saw a display in a window of 3 big red stars. My first thought was that it was very festive, but then I got a USSR-military feeling and I wondered how appropriate it would really be as a Christmas card. And then I remembered that I have a son for whom this design is PERFECT. He's a member of the Royal Canadian Air Cadets and loves all things military. And yesterday, I bought him a new pair of shoes in size 11!!! My husband's feet are not much bigger than that, and Struan still has a few years of growing! PS - no problems with W8 so far (except that some of the keys on the keyboard are different and mysterious). Still, it will take a bit of time to get used to the little changes in how to do things. On the upside, Photoshop is WAY faster, so that makes me very happy! 3D.....Wow - so effective! At first glance, I thought that the stars were popped up with dimensionals. I sit here and shake my head in awe of your creative talent! Happy that you share these sweet ideas with us! Love the simplicity of this one Ardyth - wherever the inspiration comes from. Love that sentiment, will have to find that one. glad the new computer is working out! Love the clean feel of your card. Oooo Love clean masculine cards! Love the way you stamped those stars. And, it all pulls together into a great, CAS card. Ardyth you stamped those star perfectly, I really like the shadow effect. A fabulous military card and your son will LOVE it. Perfect 3D effect and the frames fit very well! A great male Christmas card. The double stamping is inspired. It really gives the image a lift off the paper. Very cool card! Love the traditional colours with the very clean layout! Pleased to hear you're getting on okay with W8! 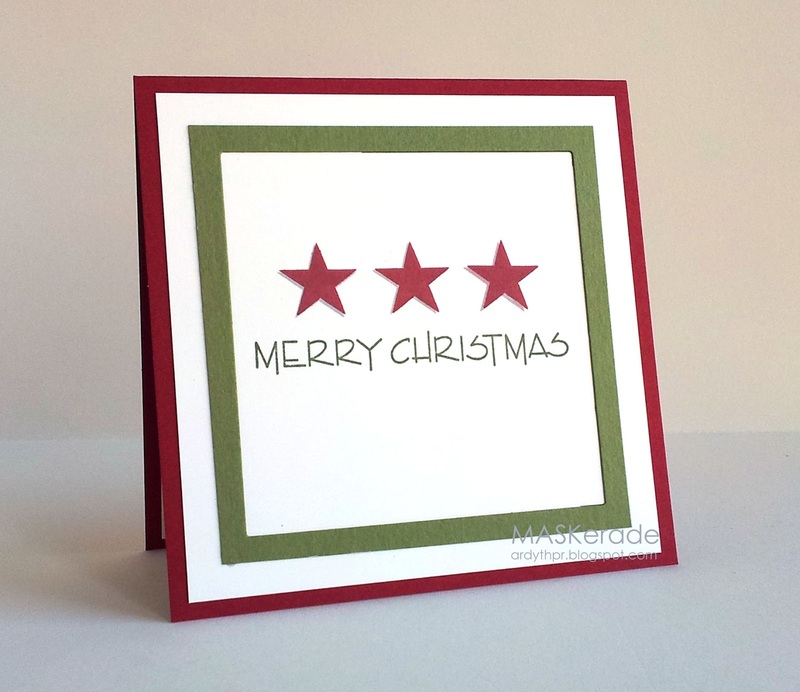 GREAT shadow stamping ... totally assumed those stars were die cuts! Love that it's masculine too. Oh, and I need to mention that you totally saved the day/week with your advice to emboss on metal to decrease the warping effect. I embossed on my 90 Christmas cards, and heating the other side would have been another step that I didn't need. Instead, I embossed with the paper directly on my metal lamp base (you can tell I had to move my crafting to be by an outlet!) and it worked like a charm. I was so very happy! And relieved. THANK you so much for your advice!